Play list: The clean sandpit at Hide &amp; Peek. Photo: Courtesy Hide &amp; Peek. In Bangalore I finally found the house of my dreams. It’s bright, airy, perfectly located and affordable. And the best part is it doesn’t belong to me. Since the city frowns on children walking on the grass in its rundown neighbourhood parks, I struggled to entertain Babyjaan when we first moved here. After all, you can’t really drag a 17-month-old child down the road to check out the hottie selling coconuts more than twice a day. Biceps don’t impress her, yet. The city’s “perfect" weather ensured that the swimming pool water was icy on most days. Play list: The clean sandpit at Hide & Peek. Photo: Courtesy Hide & Peek. When she started yelling “wow!" every time she entered a store, I had to stop the shopping trips. Most family members were against enrolling her in daycare, even though the variety and quality of the facilities available in Bangalore are probably the best in any Indian city. That’s when a darling neighbour with a hyperactive two-year-old, who disappeared every evening and came back looking quite pleased with himself, introduced me to the world of Play Care. Bangalore, I discovered, has at least half a dozen quirkily named places (Monkey Maze, Gambolla, Hopscotch, Hide & Peek) you can take your baby to play (and I’m not referring to those noisy play areas one encounters in malls). You pay anywhere between ₹ 100 and ₹ 250 per hour to access these serene, indoor, child-friendly playgrounds. I know childhood was once an age of free play and playing for free— but if you grew up in Bangalore for instance, the traffic never barrelled through Cubbon Park then and the children’s theatre in the park no longer screens Chitty Chitty Bang Bang or any other films. The rules of free play have changed dramatically in our cities (for example, playing on the streets is unthinkable); most parents just look for a place where their child is free to play safely. That’s why my current favourite Hide & Peek, a ₹ 1,000-for-six-turns, 4,500 sq. ft house of toys seems worth every paisa. 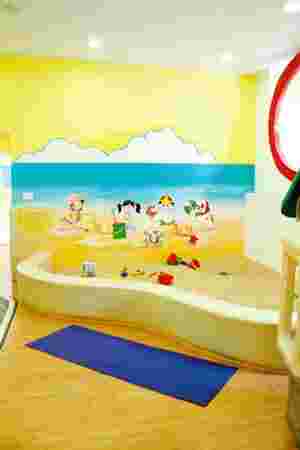 It’s a bright haven that contains a clean sandpit, a ball pool, and every non-remote-controlled toy you can think of. There’s a library with Eric Carle, Julia Donaldson and all your favourite baby authors hand-picked by owner Roshini Thadani every time she travels abroad. Thadani decided to be a play entrepreneur one and a half years ago when, like me, she couldn’t figure out how to entertain her daughter in Bangalore. The business of play is not yet profitable, she says, though the classes and birthday parties hosted on the premises do well. She’s also started a café in the house and will soon announce toddler cooking classes, a mother-toddler programme, and all kinds of baby activities. She says she’s got franchise offers from cities such as Kolkata and Ahmedabad too. Me, I’m just happy to pay up to visit the bright and breezy house where Babyjaan is free to play.